Places I've Eaten: TAQUERIA LOS COYOTES...WOULD IT STILL BE GOOD IF I WASN'T REALLY, REALLY, REALLY HUNGRY? TAQUERIA LOS COYOTES...WOULD IT STILL BE GOOD IF I WASN'T REALLY, REALLY, REALLY HUNGRY? Taquerias in the Mission, they are a like Starbucks in the rest of the city--there's one on every corner. But how do you tell one from the other. Some are crowded, some are empty, some look large, clean and spacious and some look like you could get food poisoning, mugged or stabbed just by walking in the door. Most times though you just have to take a chance as some of the best places to eat are quite literally a hole in the wall, especially where the Mission is concerned. On this particular Sunday night me and the SO are in the hood to catch a show at the Victoria and are really hungry. Enough so that we don't want to walk to far to find someplace to eat. Thus by default, we end up a block up 16th Street from the theater at Taqueria Los Coyotes. It's a pretty big space when enter and are immediately assaulted with smoke from the grill, a loud soccer game on the TV and Christmas decorations everywhere. Basically, it's just like every other taqueria. The one thing I am overwhelmed with is the menu. It's HUGE! And covers most of the wall above the grill, salsa bar and order counter. Below is just part of what is up. It took me a few moments to take it all in. I wasn't in a particular burrito or chips mood which is probably why my eye caught on to a photo of a plate of fries covered in stuff and CHEESE! Yes! That is exactly what I am having, the SO can fend for himself. 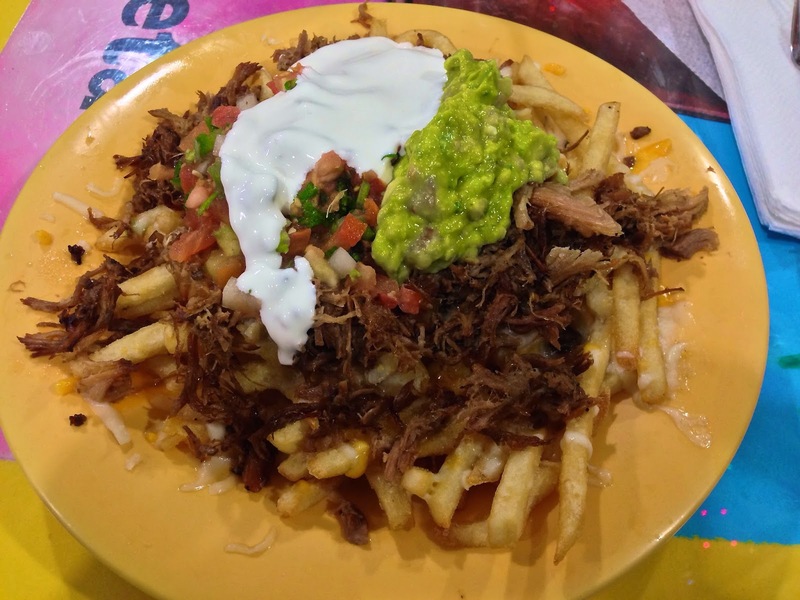 Carnitas (that's like double cooked pork) fries with salsa, sour cream, guacamole and cheese. Basically a nachos with fries instead of chips. Just look at it! A heaping pile of meat and potatoes for only $8.50. Maybe I was just hungry, but this was everything I was looking for in a plate of mostly unhealthy food indulgence. The fries were hot and crispy, the pork was plentiful, if a little on the drier side, but that is what happens with carnitas. Thus you bring in the salsa and sour cream to overcome all that. I could have used just a bit more cheese. There isn't a whole lot of spice going on here but that is quickly resolved with a trip to the salsa bar where you can get mild, medium, hot or burn your tongue off. I get a little bit of the first three and alternate between bites. For filling me up and quashing my hunger pangs this plate worked perfectly and I ate all of it. The SO went in for the standard super burrito with shrimp, rice, black beans, tomatoes, sour cream, guacamole and lettuce for $9.95. I will say it was pretty big and they do stuff it full of the peripherals. However, I think at most there were roughly 7 or 8 pieces of standard size shrimp in there, thus you don't get some with every bite like you would with beef or chicken. Plus the rice was al dente, something it should never be. If I'm biting into crunchy rice in a burrito, it's a turn off. You hope it is only the rice that is the crunchy part. 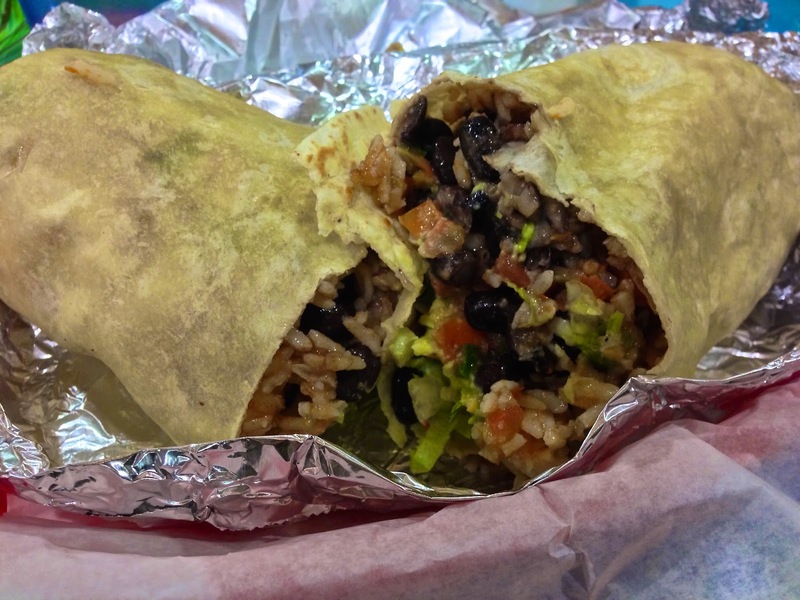 In the pantheon of San Francisco burritos, this was a miss for me. What did we all learn from this? Not much really, except maybe fries, cheese and meat are pretty good when you are really hungry. I would say how could they mess it up, but I'm sure there are many ways to do that. I mean look what happened with that burrito. Would I eat here again, eh, I doubt I'd be that drunk or hungry while seeing something at the Victoria Theater again. As I said before, there is a taqueria on most every corner in the Mission and it might be worth going just a block in the other direction to see what is available. If they are going to do the same thing with the fries every time then I'd say give the fries a try, but I can't guarantee that is gonna happen.